As self-proclaimed foodies, my boyfriend and I really love the opportunity to hang out at local establishments and indulge with hedonistic abandonment. SMOKE on Cherry Street is a great haunt to do just that. The restaurant and bar has an understated swankiness to it. It’s an upscale pub atmosphere that is completely lacking in pretension. 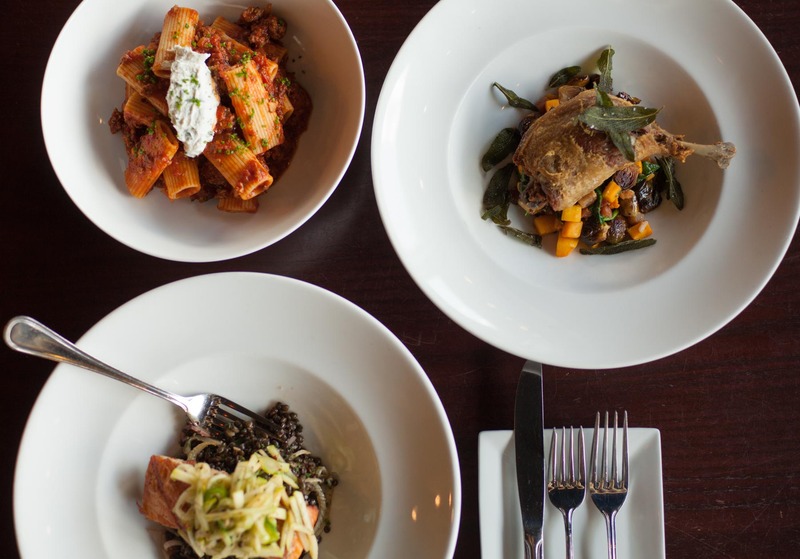 SMOKE isn’t just the name on the sign out on the street, it’s a concept that permeates this restaurant from the overall experience to the subtleties and nuances of flavors in each and every dish. The adjacent cigar room and humidor does much to add to the dining and drinking experience as well. 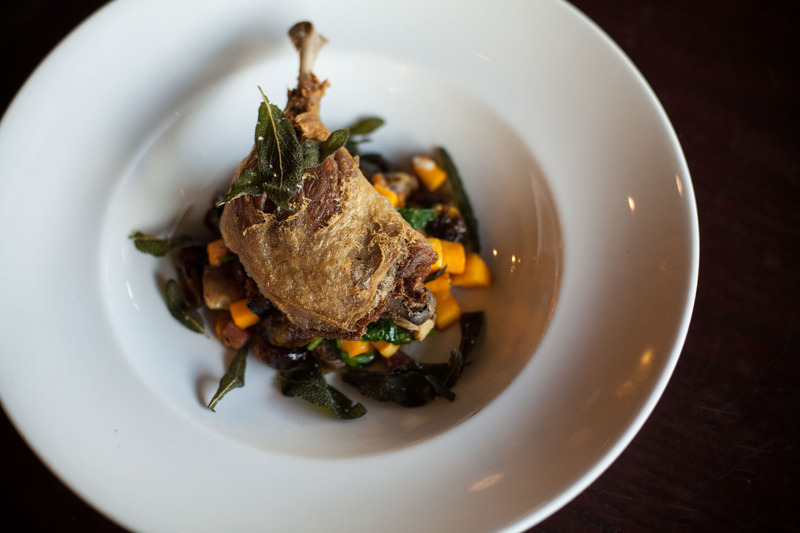 The fall/ winter menu did not disappoint with entrée options such as Pickled Brined Fried Quail, Crispy Duck Confit, Lamb Bolognese and Pork Tenderloin. For our appetizers we started out with Crispy Quail Legs, slightly coated in a sambal honey sauce on a carrot and celery salad with blue cheese crumbles. 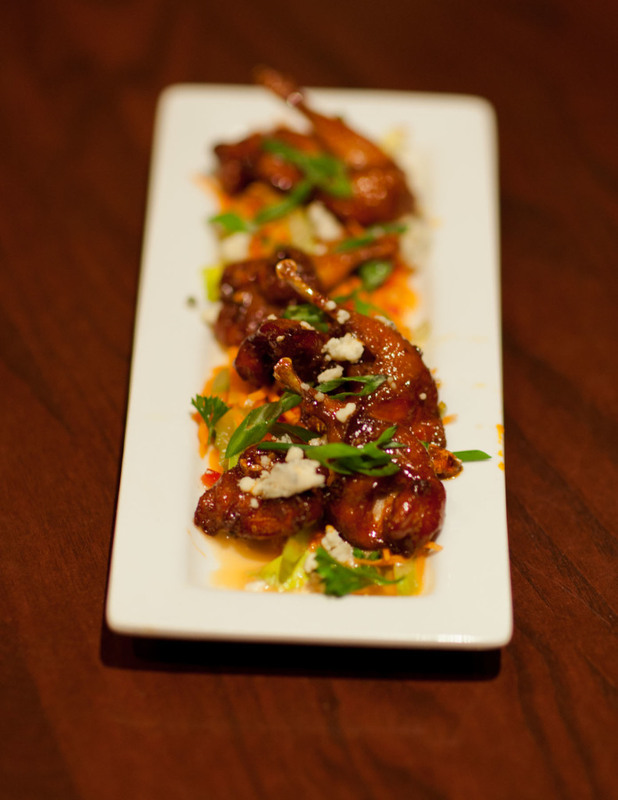 These are an elegant interpretation of the traditional hot wing. These birds were dainty, delicious, presented beautifully and surprisingly moist considering quails propensity towards drying out. We licked the little suckers dry. “Pace yourself,” I cautioned John, “or you’ll be miserable later.” He continued on, undaunted. I cursed him under my breath for his twenty-something male metabolism and felt slightly smug when he did in fact, end up somewhat miserable. For the sake of variety (or just unabashed gluttony) we also sampled the Wood Grilled Oysters with bacon Tabasco butter, served with crostinis. These had a delicious smokey flavor with the bacon and butter providing a subtle richness. 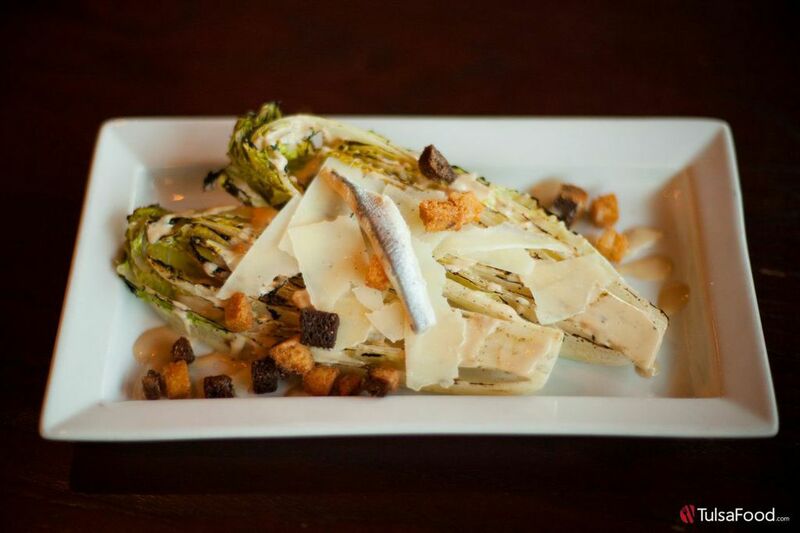 For salads, we ordered the Grilled Romaine Salad with shaved manchego, crouton, Caesar vinaigrette and a white anchovy. He dared me to eat a bite of the anchovy. I had a momentary flashback of the week before when we consumed scorpion and meal worm pizza at the Tulsa State Fair. Surely this would not be as bad. I insisted he go first. He hid his anchovy bite under a piece of lettuce and pretended to pop a bite into his mouth. I followed suit and grimaced, my taste buds apparently too unsophisticated and under developed to fully appreciate the taste of canned fish. Anchovy trauma aside, this salad is a favorite and it’s a nice take on the classic Caesar. 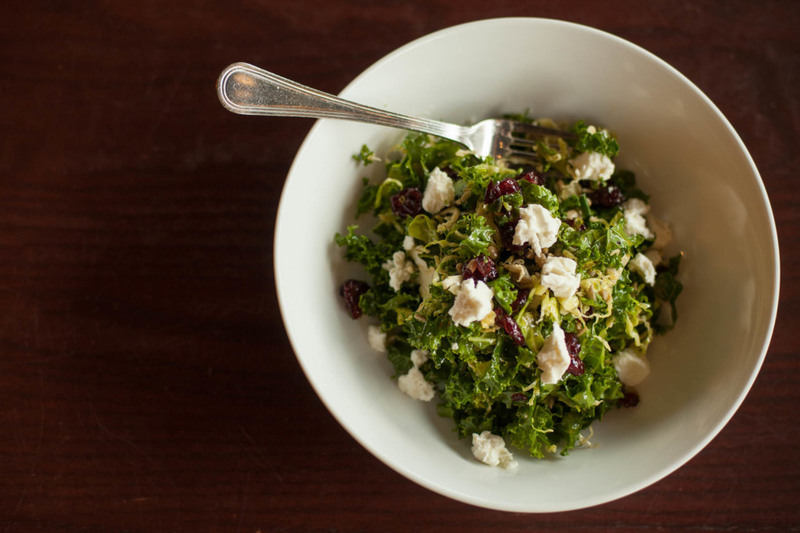 We also shared the Kale and Shaved Brussels Sprouts with sunflower seeds, cranberries, tabasco-maple vinaigrette, and goats cheese. The sweetness of the cranberries and the presence of the maple in the vinaigrette softened the slight bitterness of the kale and the pepper flavor of the sprouts. The sharpness of the goat cheese adds an extra layer of complexity. This salad is a great option if you happen to be a fan of kale but it might not be for everyone. For dinner we decided to round things out with both a meat and a fish dish. 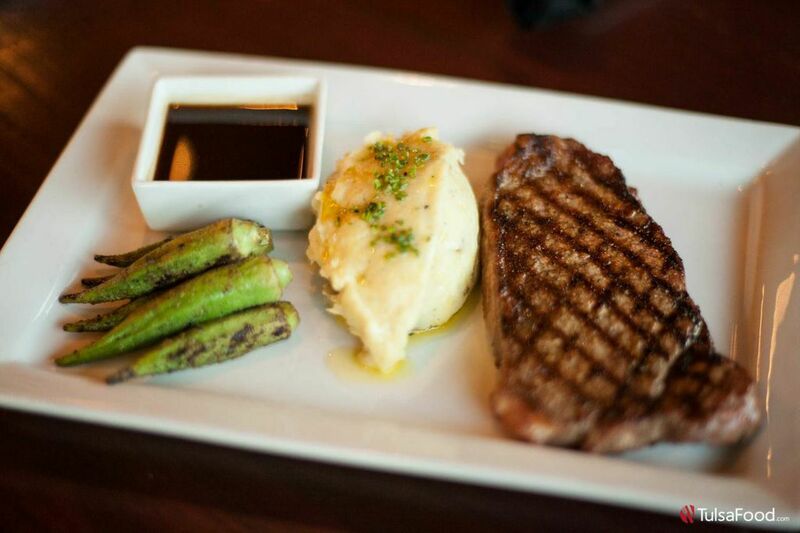 He ordered the New York Strip with truffeled mash, grilled okra and red wine demi-glace. At 16 ounces, it was enough to feed an elementary school sports team. The steak was requested medium rare and came out perfectly cooked. It was seasoned simply which allowed the flavors and quality of the meat to shine. The potatoes were piled up densely and generously but in my opinion, could have benefited from a bit more truffle in the shuffle. The okra had a nice crisp texture and was seasoned simply with pepper and grey sea salt. For the sake of being adventurous and foody-ish, I ordered the Wood-Grilled Trout with the skin ON. 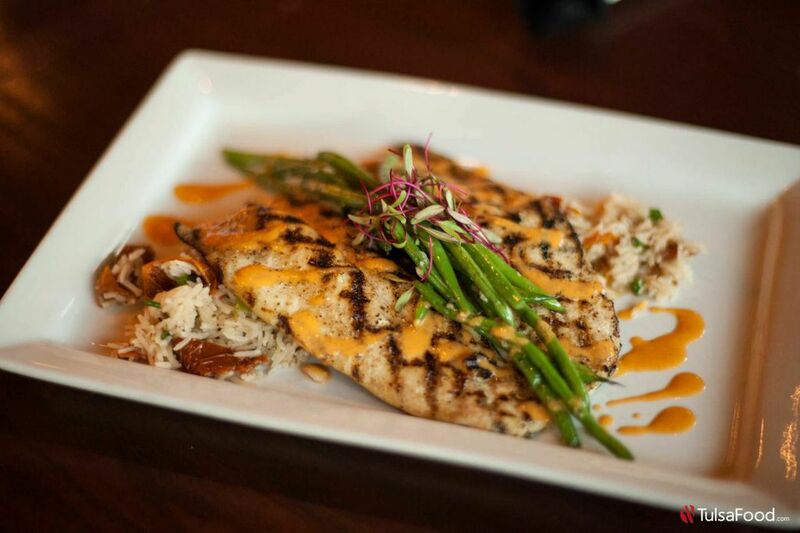 It was presented over a tomato-scallion basmati rice and topped with a smoked tomato vinaigrette and haricot vert. I definitely won the best order-er contest as my trout came out moist, tender, beautiful, and perfect, skin and all. The basmati rice was saturated with flavor and the haricot vert had a nice subtle smokiness to them that complimented the rest of the dish beautifully. For dessert, we ordered the Banana Bread Pudding and the Apple Crumble. Although a very chic presentation, we found the bread pudding to be on the dense/ spongy side, and the accompanying icing was a bit too sugary sweet for our liking. However, the banana flavored-infused caramel sauce was a really nice touch. But as for the crumble. 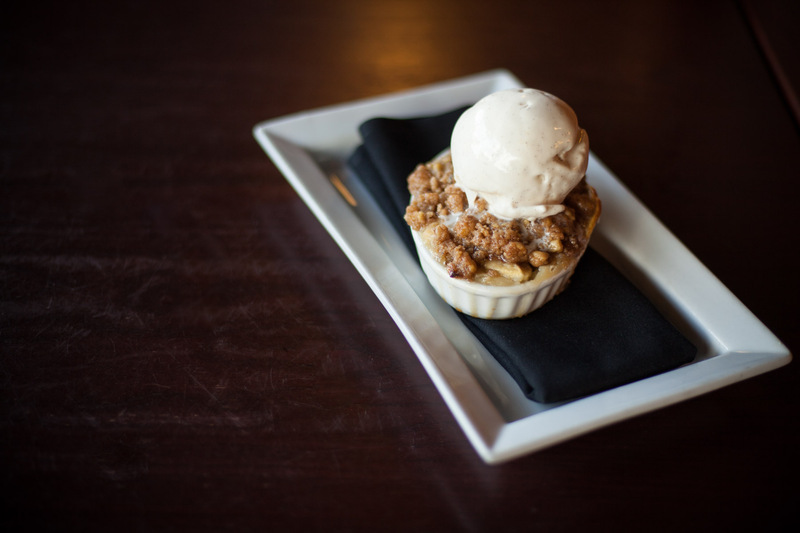 Oh, that apple crumble. It came recommended by our server and it certainly did not disappoint. When I bit into the warm apple crumble topped with melting vanilla bean ice cream, my inner fat girl squealed with delight. 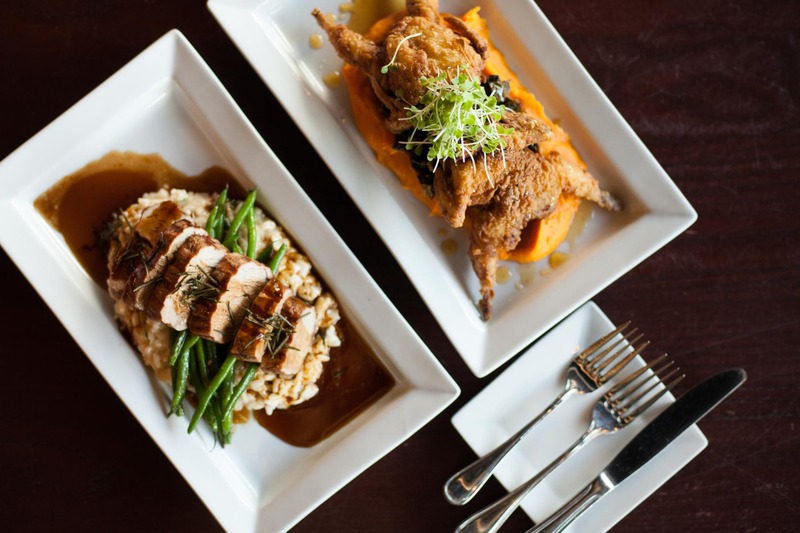 “I’ll have just a taste” quickly turned into, “get out of the way and give me the whole damn dish.” Our server was seasoned, knowledgeable, laid back and she paced our meal just right. She was always there when we needed her but never looming about when we didn’t. This gave us room to talk and enjoy our date night out. With generous mid-west sized portions, we bit off more than we could chew so it was time to ask for everything left to be boxed up. “We look like we’ve been on a shopping spree at Nordstrom’s,” John mused as we left with our arms full of bags filled with tomorrow’s lunch. Nicci Atchley graduated from Oklahoma State University and is an accomplished newspaper columnist, blogger, and local business owner. Her PR and digital marketing work with celebrities, professional athletes, the entertainment industry, luxury brands and international non profits frequently expose her to cutting edge trends. She loves writing, fashion, wine and all things Tulsa. TulsaFood is excited to welcome Nicci as one of its newest Staff columnists.